As a business, LSU has no problem making a few bucks off the labor of its athletes; as a university, it has no problem with the same athletes voicing their opinions on issues like police violence. And acting as both ticket seller and supposed free speech enthusiast, the LSU brass has found a way to please themselves and the base they sell to when it comes to the latter. The Baton Rouge Advocate reported on Wednesday that an email was sent to LSU’s more than 350 athletes by senior associate athletics director Miriam Segar to address the recent decision by the Department of Justice to not press charges against the two officers that were involved in the killing of Alton Sterling. The note ticked all the boxes university responses tend to cover during times of potential political strife, advising them to avoid violent situations and offering counseling. 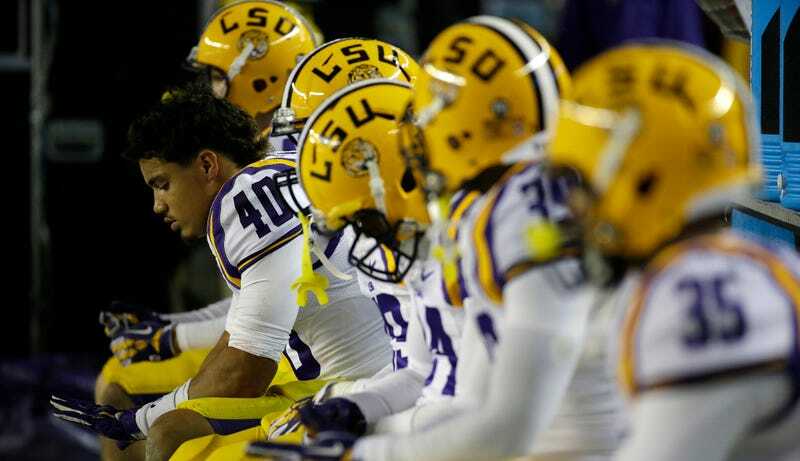 Segar showed LSU’s hand, though, in slipping in a line urging the Tiger athletes to avoid wearing any LSU-branded clothing should they choose to protest either physically or via social media. “We know this is a subject that many of you care deeply about and we respect and support your right to speak publicly and express your opinions,” the email reads, before Segar lists an array of suggestions for those who plan to speak or post messages about the Sterling decision. “If you choose to express your opinion on this issue, including on social media, we ask that you not wear LSU gear or use LSU branding,” the email reads. Sterling’s death and the cellphone video capturing his final moments led to protests around the Baton Rouge area last summer; several LSU athletes, including star running back Leonard Fournette, offered their support at the time through both physical protesting and social media posts. Football head coach Ed Orgeron was reportedly prepared to meet with leaders on the football team in the wake of the DOJ’s decision this week. As the players will likely express their opinions on the matter while speaking with Orgeron, it is unclear at this time whether the players will be allowed to wear LSU gear during the meeting.